Abstract. We propose a method to reduce the error generated when computing sea ice deformation fields from synthetic aperture radar (SAR)-derived sea ice motion. The method is based on two steps. 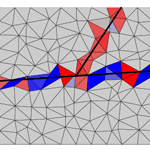 The first step consists of using a triangulation of the positions taken from the sea ice trajectories to define a mesh on which a first estimate of sea ice deformation is computed. The second step consists of applying a specific smoother to the deformation field to reduce the artificial noise that arises along discontinuities in the sea ice motion field. This method is here applied to RADARSAT Geophysical Processor System (RGPS) sea ice trajectories having a temporal and spatial resolution of about 3 days and 10 km, respectively. From the comparison between unfiltered and filtered fields, we estimate that the artificial noise causes an overestimation of about 60% of opening and closing. The artificial noise also has a strong impact on the statistical distribution of the deformation and on the scaling exponents estimated with multifractal analysis. We also show that a similar noise is present in the deformation fields provided in the widely used four-point deformation RGPS data set. These findings may have serious implications for previous studies as the constant overestimation of the opening and closing could lead to a large overestimation of freezing in leads, salt rejection and sea ice ridging. How to cite: Bouillon, S. and Rampal, P.: On producing sea ice deformation data sets from SAR-derived sea ice motion, The Cryosphere, 9, 663-673, https://doi.org/10.5194/tc-9-663-2015, 2015. We present a new method to compute sea ice deformation fields from satellite-derived motion. The method particularly reduces the artificial noise that arises along discontinuities in the sea ice motion field. We estimate that this artificial noise may cause an overestimation of about 60% of sea ice opening and closing. The constant overestimation of the opening and closing could have led in previous studies to a large overestimation of freezing in leads, salt rejection and sea ice ridging.